Acupuncture is the insertion of tiny needles into energy points (pools) along the body. Needle insertion is less painful than a mosquito bite. Once the needles are placed in the treatment points, acupuncture is very comfortable and relaxing - believe it or not! Because acupuncture has been developed for over 2,00 years in China, and all of Asia, there are many ways of doing it, some more effective clinically than others. I am extremely fortunate to be certified in The Balance Method by Grand Master Dr. Richard Teh Fu Tan, from Taiwan. The Balance Method is a very effective method of treatment based on the I Ching and Ba Gwa. This means quick, powerful healing for you! Often patients experience 50-100% recovery from the very first treatment alone! You will feel the result while you are on the treatment table or chair. Of course, healing a problem is rarely a one time treatment. Repeated treatments are necessary until the issue is resolved. The fastest and most complete recovery is achieved with frequent and consistant sessions. Dr. Tan would ask patients, "Do you want to get better in 20 weeks, 10 weeks, or 5 weeks? Of course, everyone would say "5 weeks!". Dr. Tan would then explain, if you want to be better within 5 weeks, come to the clinic 3-5X/ week. For 10 week results, come in 2X/week; for improvement within 20 weeks, come in once/week. Typically, I see profound results within the first 10-20 treatments. Be honest with yourself regarding expectations. If you are dealing with a chronic condition, more sessions over a longer time period are needed than if you have an acute problem. Also, during the healing process, be very patient with yourself. Healing the physical form is similar to gardening, we don't water and care for our garden once per week and expect good results. It requires constant care to create growth and change. Similarly, we don't diet once per week and expect weight loss, nor do expect to gain strength if we only work out once per week. Physical bodies simply require consistent, frequent attention to gain results! You will be able to feel your treatment "wear off", and this is important to notice. This tells you timing of how often to come back for continuing treatments of acupuncture. As you heal, you will experience the treatment holding longer and longer, until you are well. When that goal is achieved, you will have "graduated" and no longer need to come in for treatments. I am happy to report a 90% success rate among patients who fully committ to necessary treatments, this is true for pain and internal problems, as well. I run a results oriented clinic! Within the first 2-8 weeks of treatment, coming in 2-5X/week, you will experience the greatest amount of change. This is a big committment of time and resources, so really consider how important your health and well being are to you, and go for it! The healing process can be quite challenging, so staying committed pays off. Just like developing any skill, achievement happens when we don't "take a break"; rather, stay with yourself and move through the challenges if any come up. It is very important, no matter who the person you choose to work with for acupuncture, to make sure you like this person, and may grow to trust this person. Good rapport between you and your health care provider is vital for the healing process. Lastly, a word about the sensation and benefit of good treatments. The pulse of our bodies - our respiration and heartbeat rhythms - is similar to the “pulse” of the universe. That is, both exhibit expansion and relaxation phase and also gathering together phase. 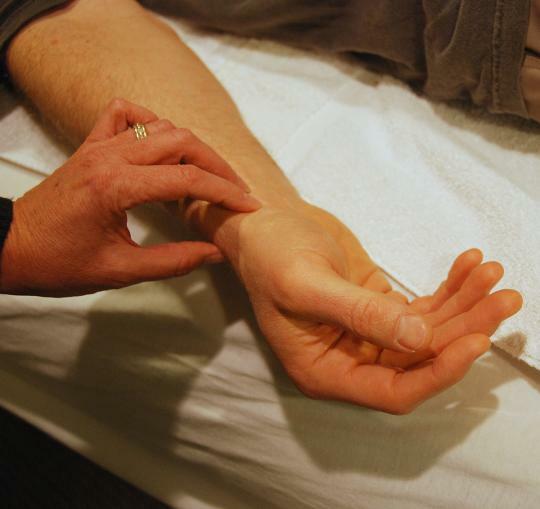 Sometimes during acupuncture you may experience a gentle sensation of expansion and relaxation pulsing in your body. It is lovely! Often you will simply fall asleep. Over time, gradually, you may have the awareness of your life expanding and relaxing, as well as the experience of your physical healing. Deep healing may happen in all dimensions of yourself: physical, emotional, mental, and human spirit. With over twenty years of experience, plus training in hospitals in China and Japan, I have cultivated a gentle technique and an intuitive sense of people. I try to listen to my patients and respond to their needs. If you are experiencing physical pain or discomfort, anxiety, insomnia, hormone imbalance, digestive issues,or other ailments, acupuncture will help! Please call Beth Bright at 303-445-1114. Beth Bright, L.Ac., Dipl. Ac., M.S.